Sweet and salty... creamy and crunchy...these differences all make for a great dish. For these Honey Walnut & Brie Tartlettes, I used prepared phyllo shells and filled them with ripened brie cheese which I then drizzled with a touch of honey and sprinkled some toasted walnuts. It's ridiculously simple yet can be quite an elegant treat too.Besides, how can you go wrong with 4 ingredients?! 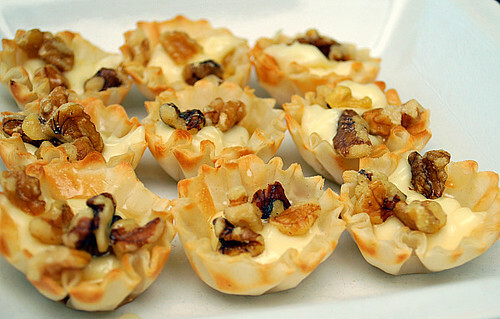 Place phyllo shells onto a serving platter. Place a heaping teaspoon of brie cheese into each shell and drizzle with honey. Sprinkle the walnuts into each shell and serve. This looks incredible! Thank you so much for posting this. Saw your tweet and had to RT it and share it with all of the walnut lovers out there. Can't wait to make it! I also couldn't imagine living life without cheese... these look great (and are a perfect size for a small pig)! Oh my.....these tartlets look phenomenal! I love recipes like this that can work as appetizers, snacks, or part of a full meal. Thank you! Oh yum...definitely making these soon. Can't imagine living without cheese either! I love cheese too. This looks like a perfect book club appetizer! Yummy. I also love cheese. I don't even have to turn the oven on for this one! Do you bake the phylo shells before adding brie or after? @King Family - thanks for your comment! The mini phyllo shells are packaged already baked so they're ready to use/eat once opened.... making it super simple and quick to make the tarts & serve. Enjoy! I got the sheets and made a sample before the big day. @King Family - If you got the phyllo sheets, you can make the cups from scratch a day in advance, but don't fill them. (When using phyllo sheets, stack a few sheets together and cut into 1 inch squares. Dip the squares into melted butter and place in a mini muffin pan to form the small tart cups. Bake at 400 degrees for 5-7 minutes or until lightly browned and crisp. Cool before filling). 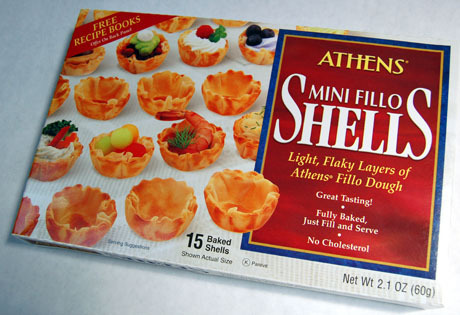 If you got the ready to use phyllo cups, I wouldn't fill them too much ahead. 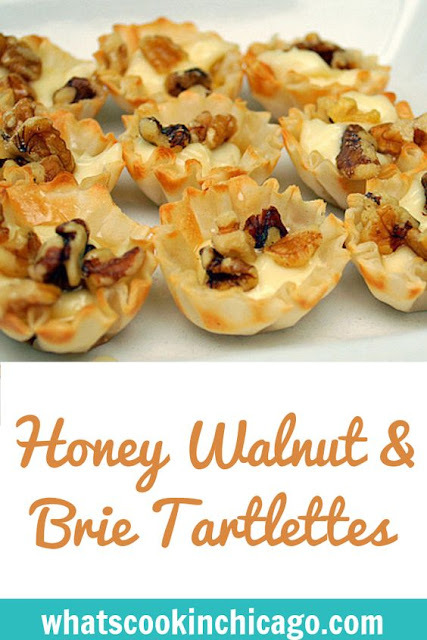 If anything, cut out small bites of brie cheese and fill the phyllo cups with the walnuts... and just before serving,drizzle with honey. Hope this helps! where do I get the already made shells? Would Jewel or Domnicks have them? Hi coolkids! You can find these phyllo shells in the freezer section of your local grocery store. Check the area where frozen pie crusts and puff pastry are sold. Hope this helps! Can we bake them to melt the cheese and have the flavors blend? I love baked brie so thought it might be good?? Thanks a lot! only use internet for that reason, and get the most up-to-date news. the favor?.I am trying to in finding things to enhance my site!I suppose its ok to make use of some of your concepts! !